1x 5 Way Tool - Excellent for use as trimming guide on larger windows and removing excess water. 1x 12" Complete Squeegee - Professional Bayersan squeegee that is perfect for cleaning the windows. 1x Blue Max Blade + Handle - Ideal for pushing excess water from under film. 1x 6" Triumph Scraper - Excellent for cleaning hardened dirt from windows and removing adhesive when stripping film. 1x Triumph Scraper Blades Pk. 25 - Stainless steel blades for triumph scraper. 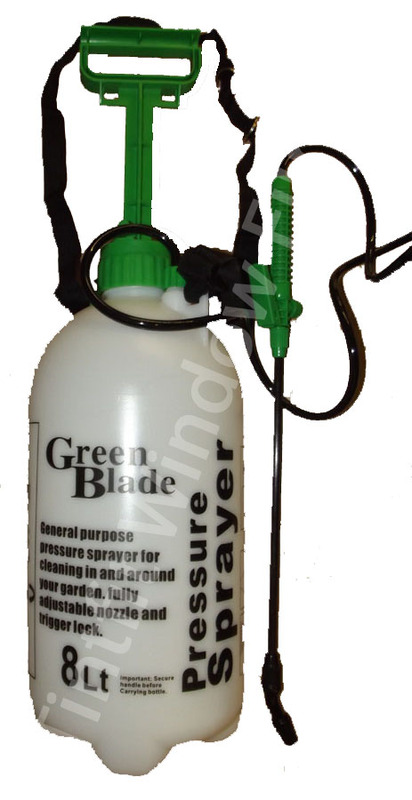 1x 2L Pump Spray Bottle - Ideal for applying window films. 1x 8L Pump Spray Bottle - Ideal for applying window films to larger windows. 1x Heavy Duty Squeegee - Ideal for pushing excess water from under thicker safety films. 1x White Card - Great for removing excess water with tissue wrapped around it. 1x Gold Card - This card can be used as a trimming guide or can be used to remove excess water.